Melt-in-your-mouth, fall-off-the-bone, rich and delicious, these short ribs will warm the coldest winter night. 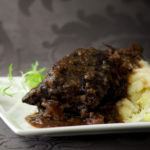 Braised with Cabernet Franc and parsnips, the gravy develops a rich flavour with a subtle peppery depth. Even better the next day, this is a perfect make-ahead meal elegant enough to serve at a dinner party, yet equally suited to a casual family dinner. 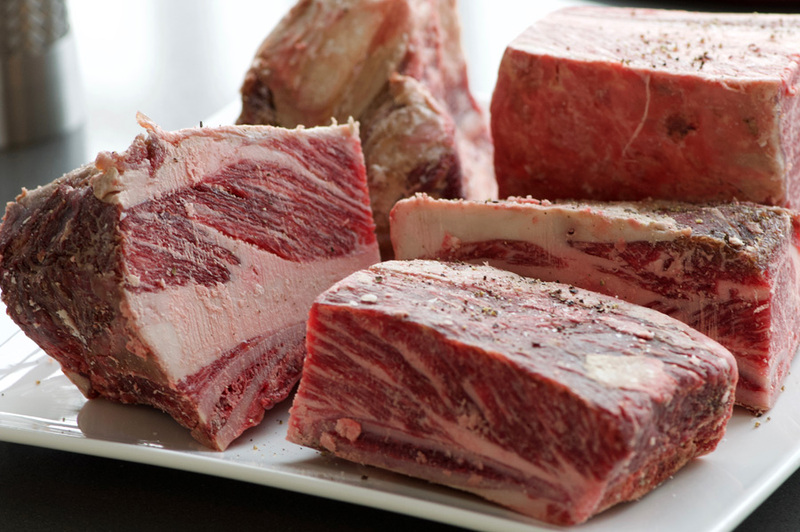 To begin, the short-ribs need to be cut parallel to the bone, also known as “English style”, so that there is one bone per piece. Avoid flanken “Korean style” cut ribs for this recipe, as the meat is cut much thinner and wouldn’t work as well with the long braising time. Below are the ribs straight from the butcher, I had them cut the ribs which were originally closer to 5″ long in half, into more manageable 2.5″ pieces as shown below. All together I had about 6 lbs of meaty ribs—this is pretty much the max amount my generous dutch oven would hold. You can see from the photo below that the meat is well-marbled with fat. The braising process slowly and gently cooks this fat so that it renders down leaving silky soft meat that falls right off the bone. I highly recommend making this a day in advance so that you can easily remove all the fat from the gravy—when you chill the broth in the fridge all the fat floats to the top and hardens so that you can just lift it out in a large piece. The remaining broth will be wonderfully enhanced by natural collagens from the bones giving your gravy natural body and thickness. To build the flavour profile of your braise, it is critical to get a good sear on the ribs. I had to do mine in two batches to avoid overcrowding. Go with high heat and make sure they sizzle when they hit the pot. You want a deep brown colour on the seared areas, and also look for some browned bits of meat to begin to stick to the bottom of the pot—you’ll scrape up all those bits later and they form the flavour base for your broth. Once all the ribs are well-browned, remove them to a bowl and set aside. Add the onions to the pot and cook until they start to turn golden, about 5–6 minutes. 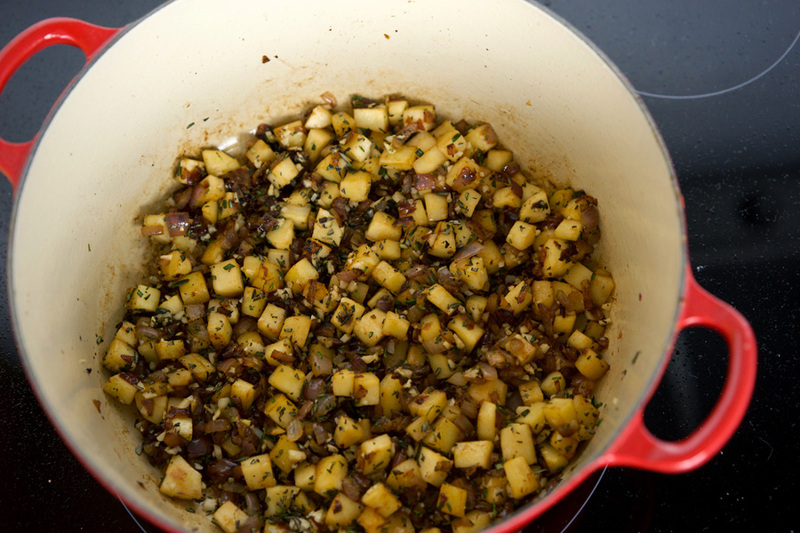 Add the parsnips for another 5–6 minutes, then add garlic and rosemary and cook some more. Once all the vegetables are golden, it’s time to add red wine and broth. A word on the type of wine: I find Cabernet Franc works really well for this dish. Generally this grape varietal is grown specifically to be blended with other grapes like Cabernet Sauvignon and Merlot. However, it has become popular in areas like Canada’s Niagara region as a varietal to enjoy on its own. It ripens a bit earlier than Cab Sauvignon so tends to fair better in the Canadian climate. I find Cab Francs tend to have a peppery quality with notes of tobacco and cassis that I really enjoy, while it goes lighter on the tannins. These qualities make it perfect to braise the short ribs and delivers a beautiful gravy when paired with the parsnip, rosemary, onion and garlic. The pot of ribs with wine and broth is placed into a preheated 325° oven where it gently braises for 2.5 hours. Once ready, the meat will have have shrunk considerably (as much of the fat will have melted away into the broth), and if you take a fork to it, the meat will be very soft and fall away in shreds. Often some bones will come loose while it cooks; you’ll find them floating freely in the broth. Once the meat is cooked, I find it is best to remove the ribs, setting them aside in a sealable container, and then transfer the cooled broth into another container to be chilled in the fridge overnight. This way you can easily remove the fat which will harden into a single piece on top of the broth. If you can’t bring yourself to wait and want to eat these immediately (which would be totally understandable!) allow the broth to sit without stirring for 5–10 minutes; you’ll notice the fat will sit on top of the broth (but being clear it is a bit hard to discern from the actual broth). I once skimmed almost two full cups of fat, and I was doubting myself, wondering if I was being over zealous and skimming broth rather than fat. I decided to freeze it to check, and sure enough, it was all solid hardened fat! Whether you patiently wait overnight or skim off the fat while warm from the oven, the next step is to bring the broth to a simmer and add flour mixed with butter to thicken it into a light gravy, just thick enough to coat the back of a spoon. Then the meat is added back into the sauce to be warmed up, ready for serving. Some like to puree the parsnips to further thicken the sauce—if you do this very careful that no stray bones are hiding in your sauce! Personally I like just leaving the parsnip pieces be. 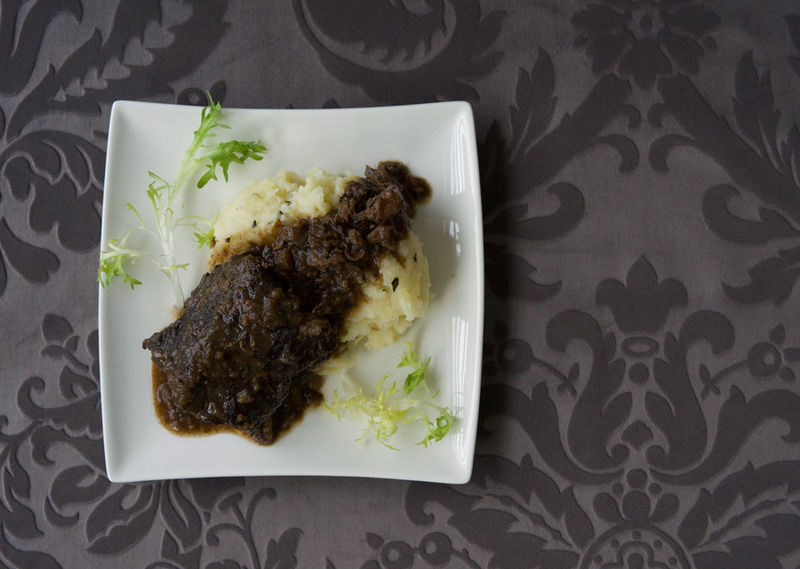 The short ribs are great served on your favourite mashed potato recipe, or to change things up you can make the parsnip-potato mash with rosemary to compliment the sauce. Recipe for the parsnip mash is below. 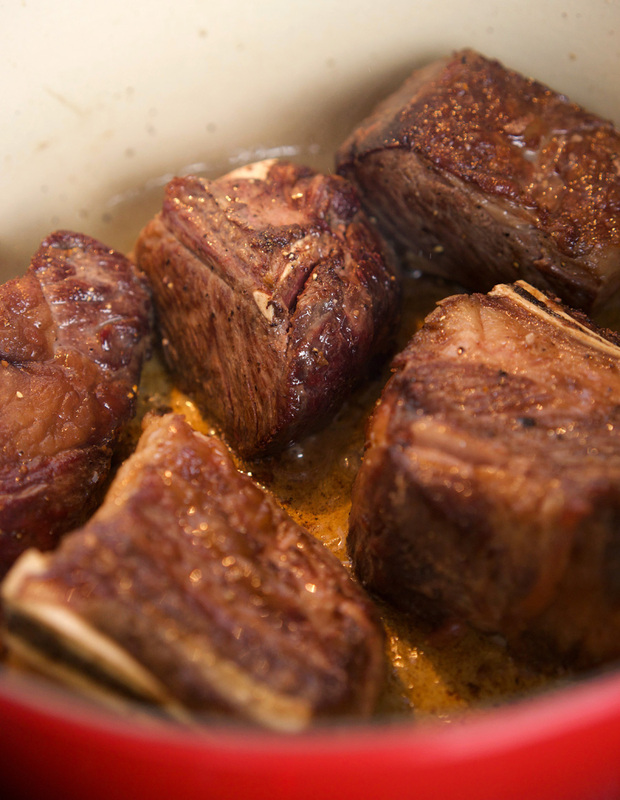 Melt-in-your-mouth short ribs are delicious and simple to make. Best made the day before to allow for the easiest removal of excess fat from the broth. 6 lbs 2.5–3" meaty beef short ribs (about 8) "British cut"
Trim large fat from edges of ribs and season with salt and freshly ground pepper. Melt better in an oven-safe dutch oven pot over medium high heat. Add ribs to pot and brown well on all sides (add ribs in at least two batches to ensure proper browning). Remove browned ribs to a large bowl and set aside. Add onions to pot and cook until golden, about 5 minutes. Add parsnips and cook until golden, another 5 minutes or so. Add garlic and rosemary, cook until garlic has softened slightly. Add the bottle of red wine and the beef broth. Bring to a simmer, scraping up the browned bits from the bottom of the pot. Return ribs to the pot, cover, and place into a preheated 325° oven. Braise in the oven for 2 1/2 hours. Remove pot from oven, and transfer the ribs to a bowl. Check for any loose bones that may have come loose and are drifting in the broth, and remove. Ideally place the broth and meat in separate containers and refrigerate until the next day. 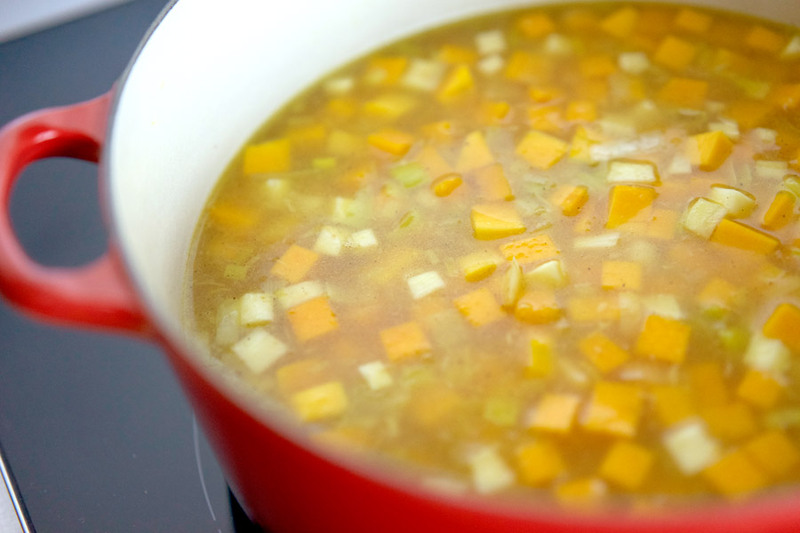 When ready to serve, remove the layer of fat from the broth and discard. Bring the broth to a simmer. Mix 1 tablespoon of butter with the flour and blend into a paste. Add to the simmering pot to thicken the broth into a light gravy. 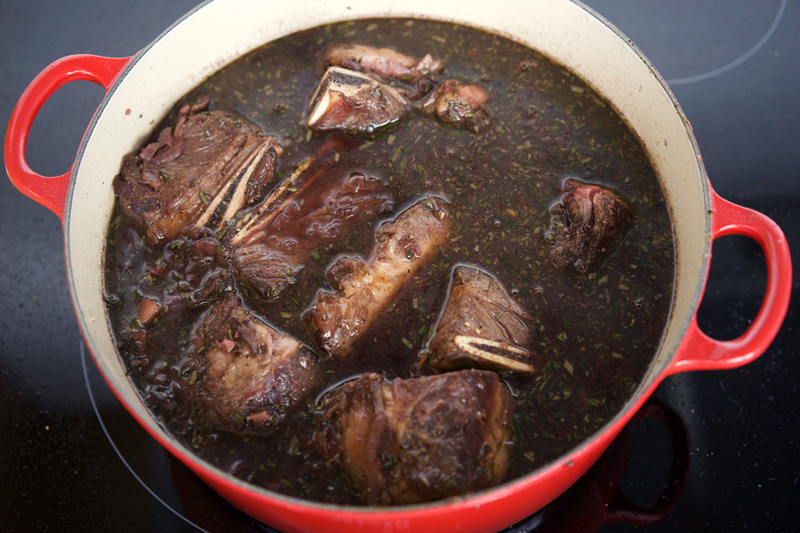 Return meaty ribs to the pot and simmer over low heat until they are warmed through. Plate and serve with mashed potatoes. Fill a large pot with water and add parsnips, potatoes and a generous pinch of salt. Bring to a boil and cook for 15–20 minutes, until the potatoes and parsnips are very soft. Drain. Meanwhile, in a small bowl or glass measuring cup, microwave milk, butter and rosemary until the butter has melted and the milk is warm. Add to the cooked and drained potatoes and mash. Test for flavour and add salt if needed. Serve with short ribs and gravy. 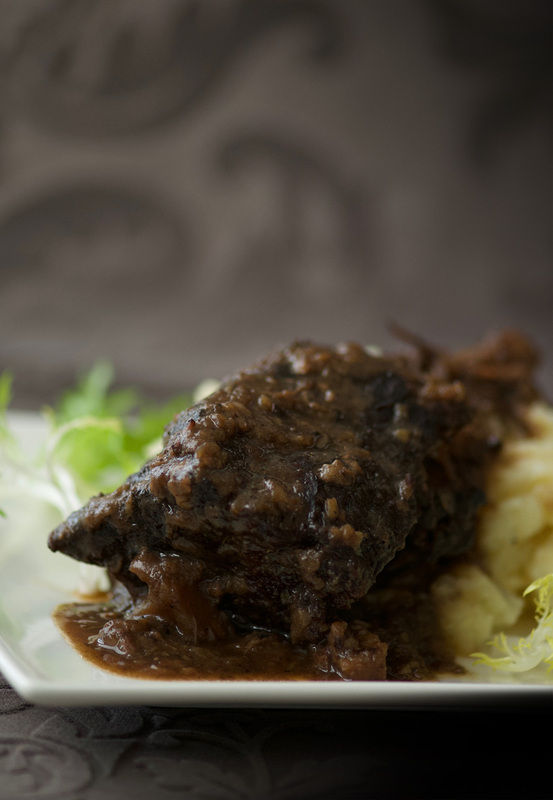 This recipe was based on Zinfandel-Braised Short Ribs over at Epicurious. Nothing says autumn like a crisp chill in the air, the distant smell of wood burning from someone’s chimney, and the warming comfort of a bowl of butternut squash soup. 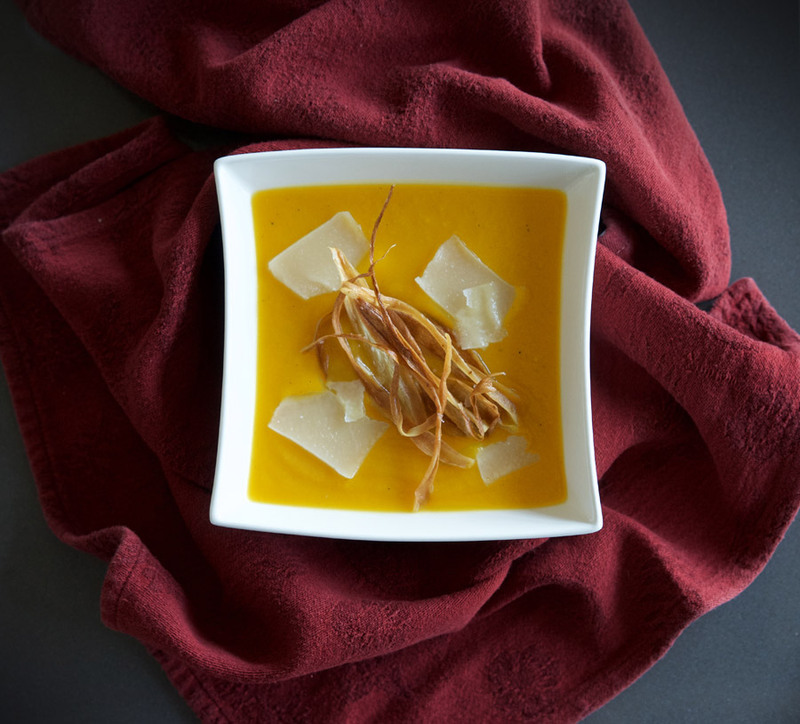 With its brilliant orange colour, warm gingery notes and earthy parsnip, this soup was made for fall. A simple recipe that comes together quickly, I make this often during the cooler months, in part by taking advantage of a time-saving tip: buying the squash pre-peeled and cut at the grocery store. 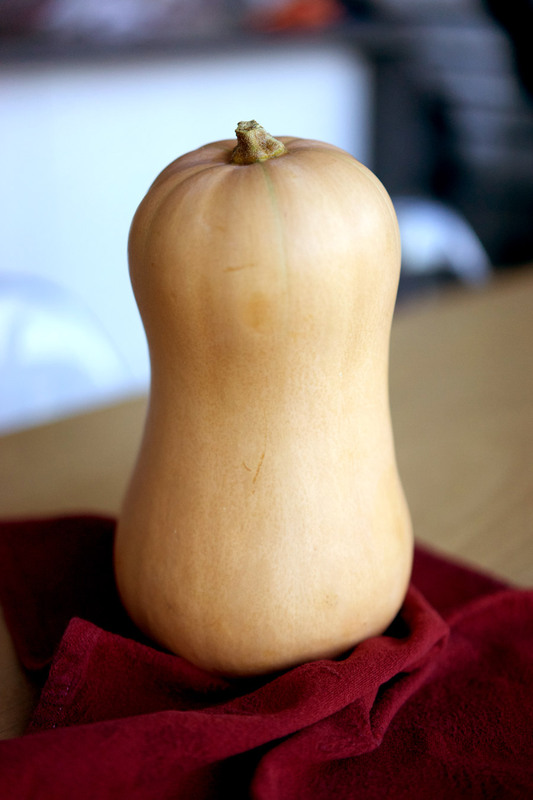 Then again if you have the time, there is something really satisfying when you select a perfect, smooth and plump butternut squash like the one pictured below, and take the time to peel and and chop it yourself. 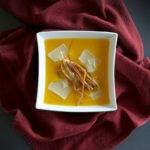 This particular squash was so large, just the top half provided enough for this soup recipe. If you do cut your own, set the seeds aside and toast them with some salt at about 375° for 15–20 minutes until deep golden, they are such a tasty snack! 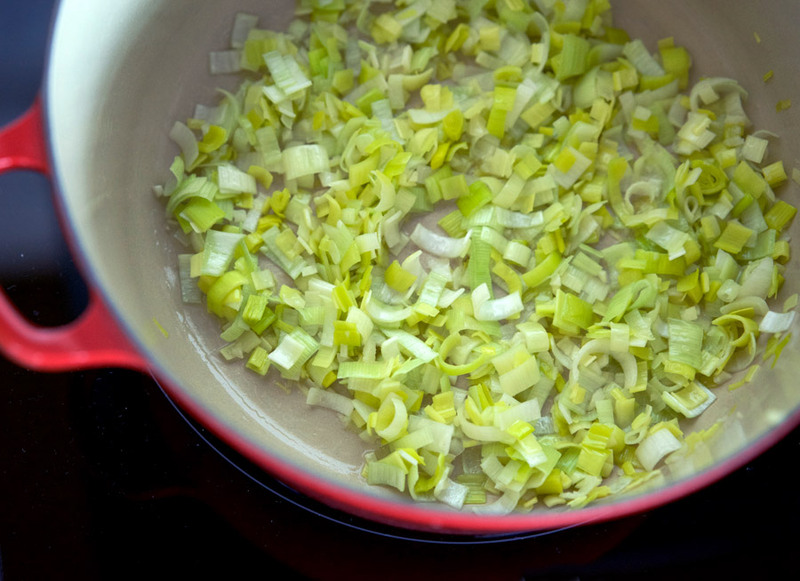 Once you’ve prepped all your veggies, start by gently cooking the leeks and garlic over low heat. Next add the ginger, turning up the heat to medium high and stirring that ginger around to draw out the flavour. Add the butternut and parsnip. Sauté in the pot until a slight brown crust develops on the bottom of the pan—these brown bits add a lovely depth of flavour to your soup when you add the chicken stock and scrape them up (for a vegetarian option you can go with vegetable broth instead). How gorgeous does that incredible orange soup look in that red enamelware pot?! 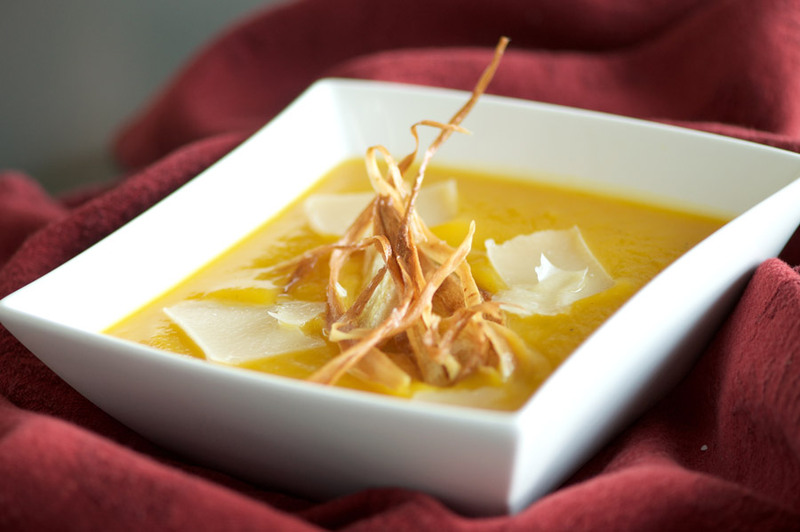 Now you could stop here and serve the soup with some thin strips of Parmigiano-Reggiano cheese and enjoy. However, if you want to really turn this into a show-stopper, fry up some parsnip chips to use as garnish. I use a vegetable peeler to slice a parsnip into ultra thin strips, heat a small frying pan with oil and fry until golden and crisp. Toss with a bit of Malden Salt and they are divine earthy treasures that really lift the parsnip notes from the soup to elevate the dish. The colourful soup takes on a lovely modern style with the addition of the parsnip chips. The perfect bowl to celebrate the beginning of the harvest season! A rich soup with the warming heat of ginger and a hint of earthy sweetness from parsnips. With no added cream, there is no guilt in treating yourself to this autumn favourite! The parsnip chips make for great presentation and add to the flavour, but If you don't have time, it is still a great dish without them. Cut and prep all of the ingredients. Heat olive oil in a large stockpot or dutch oven over medium-low heat. Add garlic and leeks and cook, covered, for about 5 minutes until the leeks have wilted and softened. Add ginger and cook for about 30 seconds, stirring well. Increase heat to medium high and add squash, parsnip, salt and pepper. Cook, stirring frequently, until a golden crust forms on the bottom of the pot. This will help develop a rich flavour for your soup. Add the chicken stock and water, scraping up all the browned bits from the bottom of the pot. Bring stock to a boil, cover, reduce heat and simmer for 20 minutes. 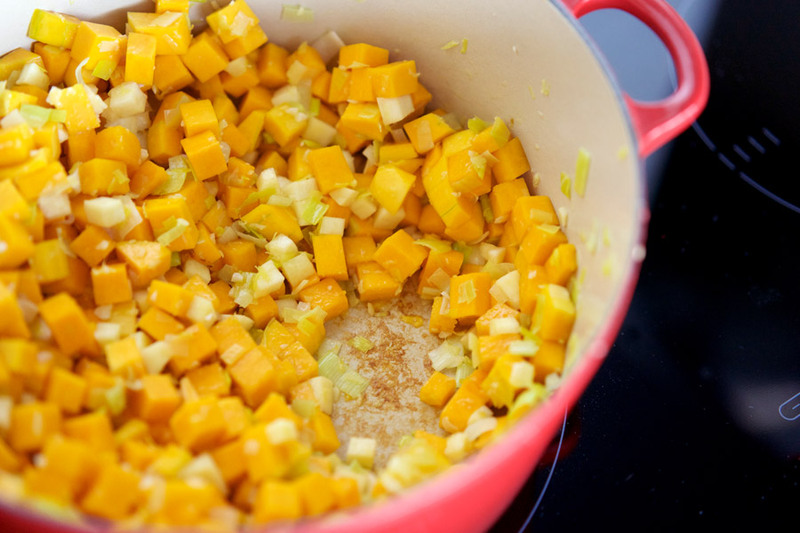 Test the squash and parsnips to ensure they are soft and cooked through. 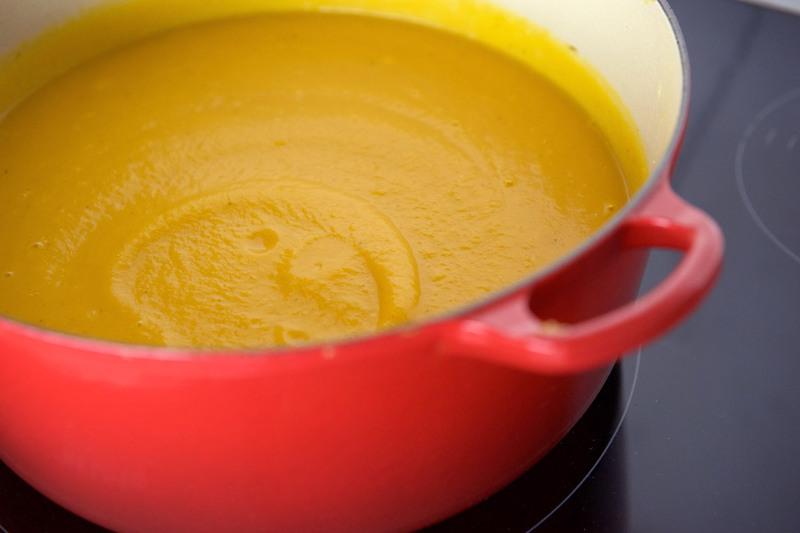 Once ready, blend the vegetables and stock into a puree using an immersion blender. Do a taste check to ensure the salt levels are good, and keep on low heat while you make the parsnip chips. In a small sauté pan, heat the canola oil on medium high. 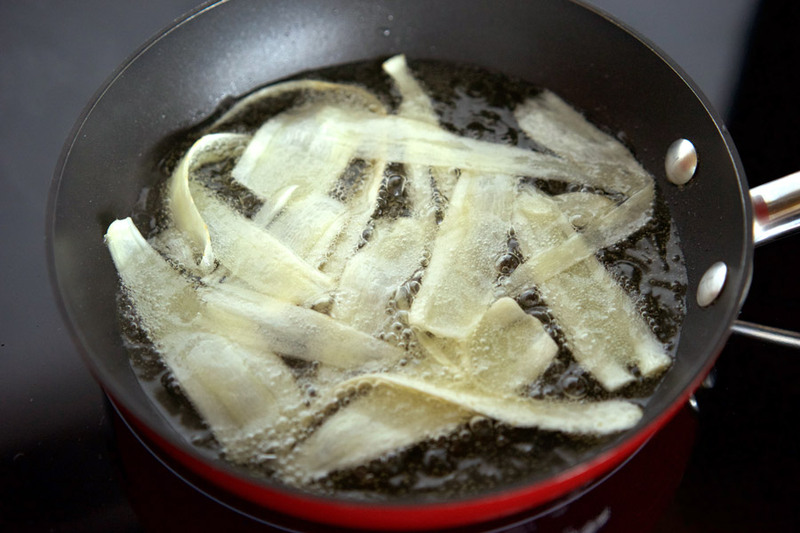 Test the oil to see if it's hot enough by placing a single piece of parsnip in the oil—if it sizzles you can add enough to loosely fill the pan as shown, two batches worked well for my 6" pan. Don't overfill or the oil temperature will get too low. Fry the chips until they are a nice golden brown, then transfer to a paper towel lined plate and sprinkle with salt to taste (Malden works nicely if you have it). Once all the chips are ready, serve the soup into bowls, add slices of Parmigiano Reggiano and top with a bundle of parsnip chips.